Squadron Signal publications has been around for a long time and produce an affordable series of references on a number of military subjects in a few different ranges. 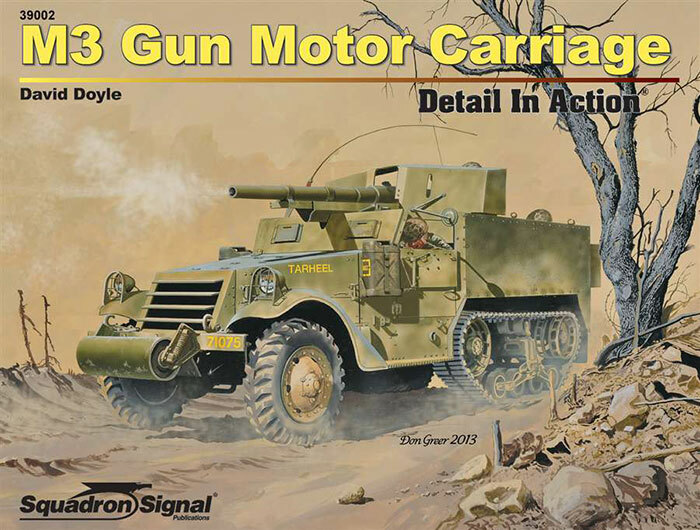 This title is in the Detail in Action series by David Doyle and follows the normal Squadron Signal format with this title being devoted to the M3 Gun Motor Carriage. The M3 GMC was an early WWII stop gap tank destroyer developed in 1941 utilising the old WWI vintage M1897 75mm Gun and the M3 Half Track Personnel carrier. Over 2000 were produced and they served in North Africa with the US Army and Italy, Philippines and the USMC in the Pacific. The British received them under Lend-Lease and issued them as Fire Support vehicles in the HQ Squadrons of Armoured car Regiments in Italy and North West Europe. They were quickly replaced in US Army service by more modern Tank Destroyer designs such as the M10 and M18 and declared Limited Standard in 1944 being declared obsolete in August 1944. A number of these vehicles were converted back to M3A1 half track personnel carriers as early as late 1943, but USMC examples served as GMCs until their withdrawal from service. The title in typical Squadron format has full page artwork of vehicles in action on the front and rear covers by well known Squadron Artist Don Greer. The format follows the usual for this series and gives a very brief history of the vehicle followed by the photographic section of approximately 30 pages showing the vehicle from development and throughout its service life with the US Army, USMC and British. These are all B&W photographs and have some smallish supporting colour plates. The second part and majority of the book is devoted to an in detail walk around of restored example covering the myriad of details that modellers like to see. There is very little published reference on these vehicles and as such this book is very welcome for modellers looking for references for the DML kit. The photos within should give modellers some good ideas for posing their M3 GMCs and ensuring the details are correct. I thought the in action shots were a bit light on but this may be due to the scarcity of actual surviving images. All users are covered with only a single shot of the vehicle in Commonwealth service although an additional one of these is reproduced as a vehicle of the Kings Dragoon Guards “Acorn Inn” in Italy on the rear cover although it is not identified as such in the caption. I had to laugh at the interpretation of this vehicle where for some bizarre reason it has a Tricolour rather than the actual RAC (red- white- red) flash. I recommend this title to modellers and historians of Military vehicles as it covers a little written about version of the venerable and versatile M3 half track family.